The London Design Festival opened this past weekend, kicking off a week of over 163 exhibitions and 42 one-day events showcasing the city’s best in architecture, art, craft and product, graphic and digital design. 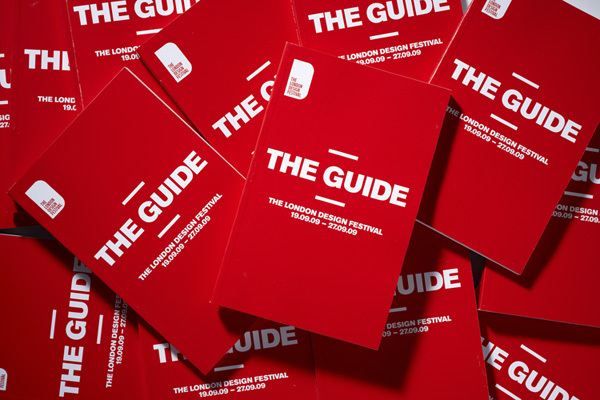 For the third year running Domenic Lippa and his team have worked with the LDF to produce everything from t-shirts, bags, invitations, posters and postcards, through to the guide, signage and displays. This year’s theme of “Be Bold, Make a Statement” reflects the Festival’s stance that good design, even in difficult times, will always stand out. This year’s identity uses quotes from famous designers, including Pentagram co-founder Alan Fletcher. This year the festival has worked closely with the V&A, which has become the hub venue and home to numerous installations, exhibitions and talks. These include a poster exhibition curated by Lippa that features work by 20 London designers, including our own Angus Hyland, and a talk by talk by New York partner Abbott Miller on the 24th. As part of this growing annual event the team also worked on support material for the London Design Medal, as well as creating a new logo for the London Design Embassy.